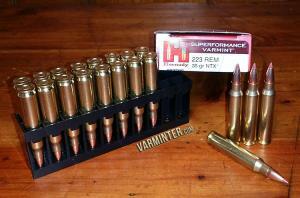 I just picked up a box of the Hornady .223 - 35 grain NTX (lead free) ammo, which they list at 4000 FPS! If it groups well in my AR15, I will be taking some of it up to NE California next month to see what it does on ground squirrels! I've already tried (and killed a coyote and numerous ground squirrels) the Winchester 35 grain LF and the Nosler 40 grain LF, so this will be one more to add to the mix. I'll be putting this through a chronograph to see how close it comes to the 4k number. Has anyone shot this yet? That should tear up a squirrel for sure. I looked long & hard at that ammo in 222 before deciding against it. Not that it won't anchor groundhogs or coyotes at those velocities,, but more from the velocity loss from 200-250yds. If I had ground squirrels & p-dogs to shoot I would definitely try this stuff. Looks like some shredders for sure!! interesting. I'd bet the 4000fps was measured from a 26" barrel and the AR will not quite get there. I await your report but still interesting either way. Most of the companies go with a 24" barrel, so if we estimate 50fps per inch, it should still be up there with the 22" barrel on my AR. I should have something by early next week. I don't recall ever chronographing my 20" AR? I did shoot the same load thru it as my 24" bolt action Savage. I saw a slight reduction in pd carnage and range with the AR as opposed to the bolt gun. At least that was my perception. But I agree the velocity loss should not be too great. Interests:Fishing with my Wife, Teaching my 4 year old to shoot his Nerf rifle and RED RYDER, New baby girl, Gun Range with my buddies, learning to reload, and hunting if and when i can. Is there a barrel twist suggestion for the 35NTX? I have a 20" 1:8 match grade Shilen on my AR. -Savage 105m 22 S,L,LR "truck gun"
There is not one listed, but my 1:9" twist .223 shoots them well. The 1:8" might be a bit fast, but it can't hurt to try! Btw, out of my Remington R15, I was getting much less than listed, but I will doing more testing over the next week. Interests:Shooting guns, handguns and rifles. There will be nothing left of those squirrels. 2 Each Savage A17 Semi-Auto 17 HMR owner. Savage B-Mag Flimsy barrel owner. Savage B-Mag Stainless Steel barrel owner. Savage 93R17 17 HMR owner. Ruger All American Compact 17 HMR owner. Ruger All Weather .204 Ruger owner. Ithaca Model 72 Saddle Gun owner. S&W M&P 15-22 owner with Black Bear 50 round drums. That's our mission. Quick death, and food for the eagles, hawks, etc. These are not edible squirrels, except to predators and each other (they eat their own). My Grandfather taught me to shoot and hunt. One rule...if ya shot it ya had to eat it! Boy Woodpeckers taste like crap and that's an understatement. Also tried Owl, ground squirrel and mud hen. It all brings back great memories of a man I loved as much as life. Hodgdon's data shows the 35gr slightly less than 4000fps with a 24" 1-12 twist but it's still cooking right along. I would not be surprised if it could reach 4000 since it's so similar to the 204 cart that can easily exceed 4000 with a 32gr bullet. Any update on this ammo. I think i saw some at cabelas a while back but i must have hesitated cause i didn't get any...yet! They worked out very well. Here is the breakdown of the lead-free ammo I tested and the ultimate results on a coyote. I was never able to get good chronograph results, but I still have some rounds in my safe, so I might test them in my new LabRadar.